This two piece set includes Studio Designs' Vision Craft Station and Stool. 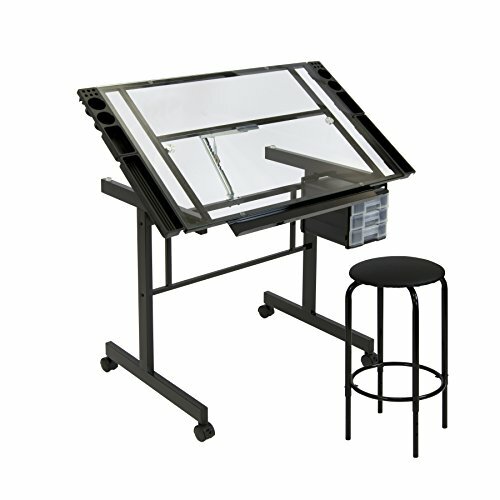 The Vision Craft Station is the ideal table for artists and draftsmen. It features a large work surface (35.5'' x 24''D) made of tempered blue safety glass. The angle of the table top adjusts up to 70 degrees. 3 slide-out drawers mount below the table on either side and a 2'' deep pencil ledge is built in for supplies. 4 removable side trays are included for additional storage. Wheel casters attach to the legs with dual locking for secure mobility. Constructed of durable heavy gage powder-coated steel. In Silver/Blue Glass. The stool has 5 adjustable height positions. Features a powder-coated steel frame, padded seat and non-skid rubber feet. Available in Silver # 10055 or Black # 10061. Station overall dimensions: 40.75 Inch Wide x 26 Inch Deep x 30 - 49 Inch high at full tilt.